This week’s sports cover has Mario Capaldi drawing gymnastics, a sport we seldom see him depicting in girls’ comics. “Just the Job” replaces “Behind the Screen” this week, and its job is to inform us what’s behind the world of pop music. Alley Cat takes the spot as the humour cartoon this time. Snoopa must have been on holiday. The Gypsy Rose story is another recycled Strange Story, and it’s a morality tale in “be careful what you wish for”. A genie grants Persian girl Farah three wishes – but warns her to think carefully before making a wish because he can only grant exactly what she asks for. This means granting her wishes literally, as Farah finds out when she blows her first two wishes because she jumped the gun and did not heed the genie’s warning. Will she think carefully about the third wish and make it the right one? Or will she end up wasting three perfectly good wishes – and maybe have an even deeper regret than that? Ferne’s plan to help Jolie get over her dancing block is to dress up in her mother’s Firebird costume and pass herself off as “The Ghost Dancer”, which the girls all think is haunting the school. The plan does help Jolie’s dancing – but then blabbermouth Jolie tells everyone, so now the ghost rumour is worse than ever. In “Land of No Tears”, the Gamma girls beat the odds and make it through the preliminary rounds in the Golden Girl award. Unfortunately there’s now a lot of heat on them, especially as the authorities are astonished to find no record of Cassy in their computer (well, there wouldn’t be as she’s an unwitting time traveller from the 20th century!). The dreaded Hive Inspector is being called in, and Perfecta is on the trail of the Gamma girls’ secret trainer. Miss Simon – after a taste of what asthmatic Paul goes through – agrees to Marie’s request to let her have Simon Hall a year earlier because Paul is deteriorating so badly. Even so, it’s still nine months off. Will Paul last the distance? Pam’s still stuck on the school magazine and Miss Peeble tries to help, but not very successfully. Miss Larks is definitely not under arrest, but she is on leave, and it’s linked to what Pam thinks is a blackmailer. She spots someone in Miss Larks’ apartment who could be the miscreant and gets the gang organised to catch him. Sir Roger answers a “ghost for hire” ad. Sounds reminiscent of the old “Rent-a-ghost” strip from Buster. Tansy tries all sorts of nutty tactics to avoid “Dismal Dee” – but she’s the one who ends up dismal, because it cost her the chance of a concert ticket to see her current favourite pop group. As well as having to fend off the cheating Syreeta and Selena, who are out to cheat her out of a disco contest (Syreeta) and netball match (Selena), Nadine now has to choose between the two events. For the first time she shows team spirit and chooses netball over disco. Stuffy Betty has had a change of heart too, and she wants to help Nadine against the two cheats. As the cover and letter page state, Jinty has returned after a 3-week absence due to one of those strike actions that always bedevilled IPC. The strikes contributed to the downfall of several IPC titles, including Tammy in 1984. Magic is still causing problems for “The Girl Who Never Was”, not least of which is because she has a limited number of them to use. This problem leads to her getting grounded – magically – and she has a vital swimming contest to go to. Sue should really watch her words when she asks for something from Henrietta. She has a job in a sweet job but asks Henrietta for a spell to prevent her from touching them so she is not tempted to eat them while selling them. But as Sue soon discovers, the word is “touch”. The boot camp children’s home gets flooded while Dorothy and Max are shut up alone in the place. This turns out to be a blessing in disguise because it enables them to float away to freedom on an airbed, and the flooding will be a richly deserved comeuppance for that horrible drill sergeant matron upon her return. It might even be the end of the institution, thank goodness. But fresh trouble just has to be around the corner. Dorothy hurts her ankle, so their journey to rainbow’s end is put on hold while she rests it – in the wreckage of a German fighter. Flooding is also putting an end to the slavery the aliens have put the humans under. And it’s all because the aliens are so terrified of water that they have never developed the skills to handle it. They can’t swim, and they have no water drainage systems, no watercraft, and no methods for coping with flooding – all of which humans have developed because they clearly evolved differently from the aliens. So the humans are free – for the moment. In “Fran’ll Fix It!”, Fran is trying her hand at being a drill sergeant with the army of schoolgirls she has raised to protect a racehorse. However, the school gardener soon shows Fran how army drill should be done; he used to be a sergeant major. Cherry finally gets her big break in stardom with her uncle, which gives her a break from the slaving her relatives have her do without her even realising. Later, Cherry sees another opportunity for an even bigger break. But cousin Michelle’s jealous and she wants a piece of the action. Helen calls for a storm to bring down the cottage so the Ullapond stone can be returned home. But it fails to do so, and her secret is in danger too. If she is found out, she can never return home. Lisa still can’t forget her piano. She finds it at an auction and gets thrown out when she conducts her usual naff behaviour to get it back. When Lisa discovers its new owner – the Mayor’s spoiled daughter – she resorts to breaking and entering to play it. Then the window slams shut on her precious hands. Will they become so damaged she can no longer play any piano? 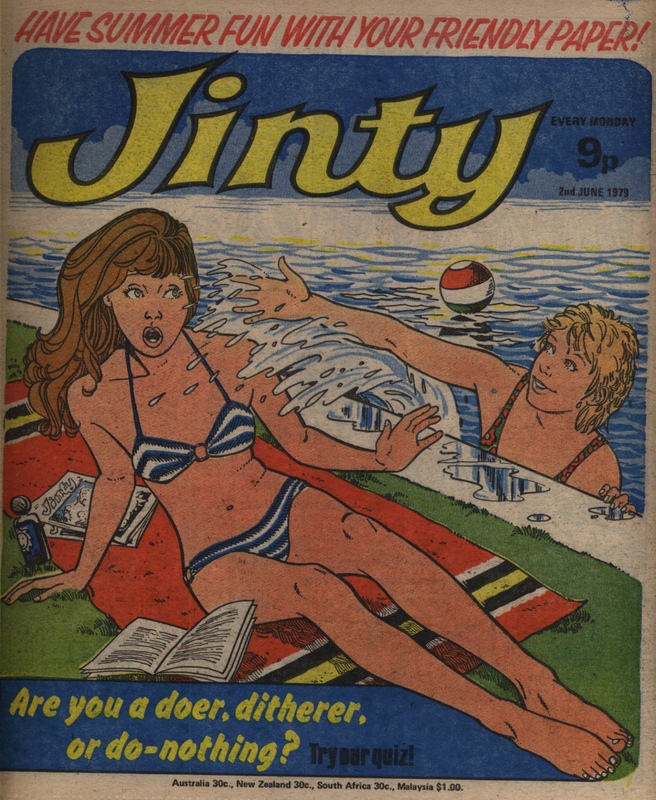 Jinty’s New Year issue for 1977 was bang on New Year’s Day. 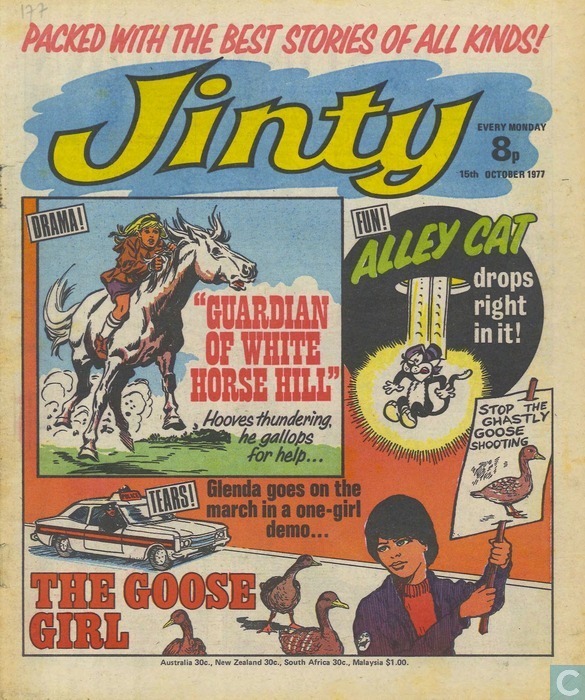 Jinty says “make it a great New Year – with us!” Indeed, in my opinion 1977 was the year Jinty hit her stride. 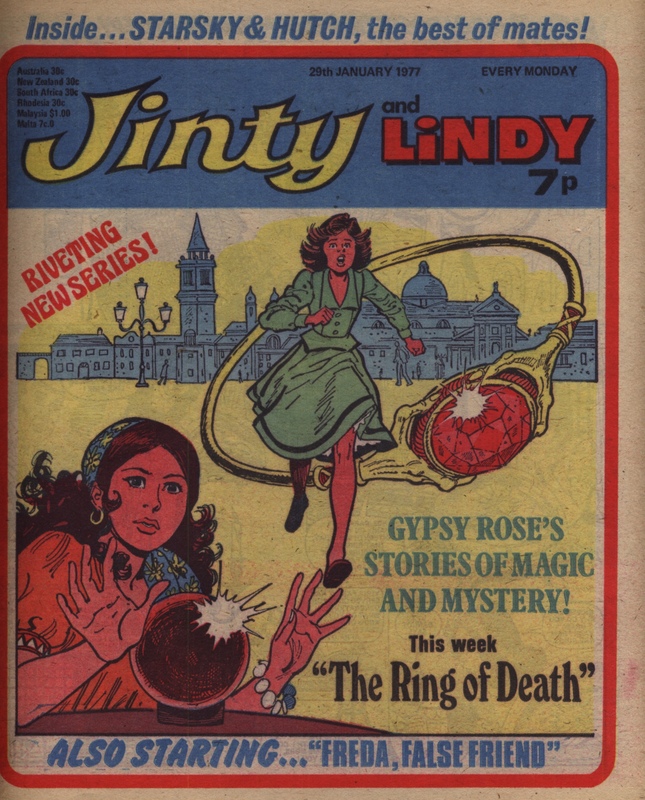 In 1977 she cast off the Lindy logo that had stayed with her throughout 1976. But what really defined 1977 as the year Jinty hit her stride was fully establishing her trademark science fiction and jauntiness with strips like the quirky “Fran’ll Fix It!” and her “smash hit” story of 1977, “Land of No Tears”. In the same year, Jinty added her resident spooky storyteller, Gypsy Rose. 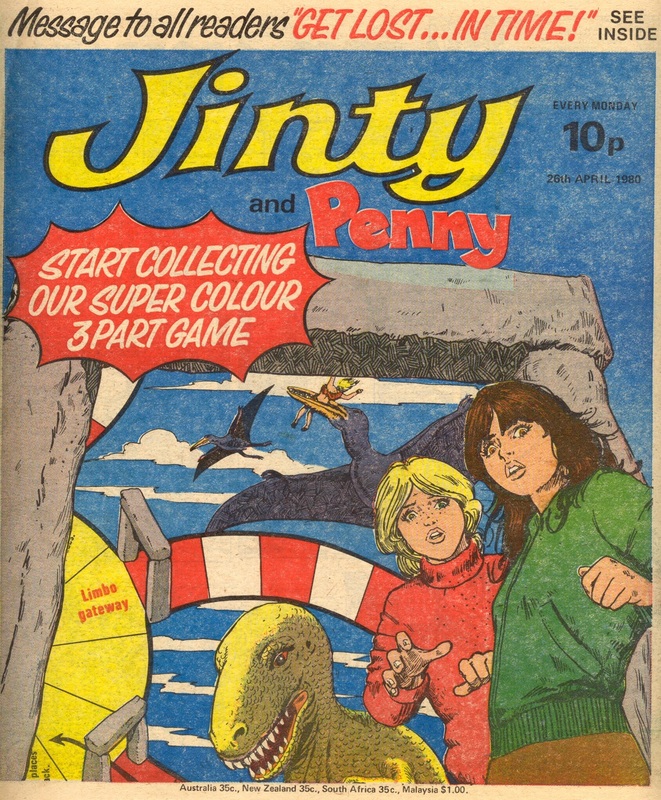 It was also in 1977 that Jinty added Guy Peeters and the unknown Concrete Surfer to her team, who would go on to draw some of her biggest classics. 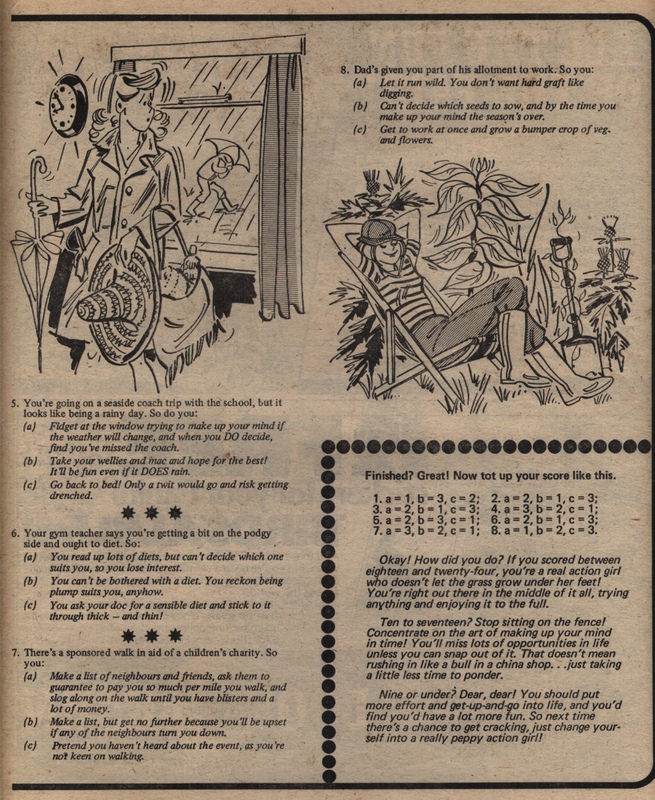 Oddly, although Gypsy Rose did not appear in Jinty until 29 January 1977, there is a horoscope in this issue saying, “Gypsy Rose looks at the stars”. Readers must have been wondering, “Who the heck is Gypsy Rose?” The horoscope appears on the same page as the blurb for a new story, “Mark of the Witch!”, so perhaps it was meant as a foreshadowing for Gypsy Rose too. If so, it is an odd one, because it gives no hint of who Gypsy Rose is supposed to be. Is it the pen name of the astrologer who writes the horoscope or something? The cover itself is a beautiful one, with its ingenious use of blues, yellows and reds. The white space lightens things up and does not make the cover too heavy. The seasons look a bit mixed. Mandy’s water-skiing panel hints at summer, while the holly the poor old druid is about to sit on implies winter. The rock Gertie puts the holly on makes it reminiscent of a Christmas pudding, which further adds to the winter theme. While Mandy and Gertie look happy on the cover, we get the opposite with Ruth and Ayesha, who are on the wrong end of a farmer’s gun. Of course we have New Year features. There is a page where pop stars like Paul McCartney and Paul Nicholas list their resolutions for 1977. In “Sue’s Fantastic Fun-Bag!” Henrietta mishears the word “resolution” as “revolution” and enchants everyone at school into a revolution instead of making resolutions. Alley Cat starts off New Year doing what he does best – annoying the Muchloots. In this case it’s raiding their larder for a New Year feast. Gertie triggers a series of events that establishes Stonehenge – its purpose being a tourist attraction – and its opening has New Year celebrations included. So far there is no end for Hetty King’s ordeal. Hetty is lumbered with looking after Jo, but Jo hates Hetty because she wrongly blames Hetty for her sister’s death. Hetty manages to secure a job as a temporary PE teacher at her new locality after Jo’s hatred forced her out of her old one, but she faces an uphill battle to win respect from the pupils. And how long before Jo’s hatred interferes with everything? Mandy applies makeup to adopt a new persona, “Bubbles”, and goes water-skiing. But really – wearing a wig while water-skiing? No wonder the episode ends with Mandy’s secret in danger. Martine’s odd behaviour is getting worse and worse. Tessa can’t figure out what the hell is going on, except that Martine seems to be acting like the crazed woman she plays onstage. As already mentioned on the cover, Ruth and Ayesha have a scary moment with a farmer. Fortunately he turns friendly after Ayesha saves his life. But then a shoplifter makes Ruth the scapegoat for her crimes, taking advantage of the prejudice against gypsies. In “Is This Your Story?”, Lynn Carter feels her family don’t appreciate her and she envies her friend Mary for being an only child. But when both girls end up in hospital, right next to each other, Lynn learns that some people may not be as enviable as she thinks and she draws closer to her family. In “Sceptre of the Toltecs”, both Clare and a class bully begin to suspect that Malincha, the mystery girl from Mexico, has strange powers. The blurb for next week says there will be more evidence of this. This issue gives us the first of a long line of Gypsy Rose stories – a spooky storyteller series which gives the Jinty editors the flexibility of commissioning a number of different artists and writers and running the resulting stories as they suit best. 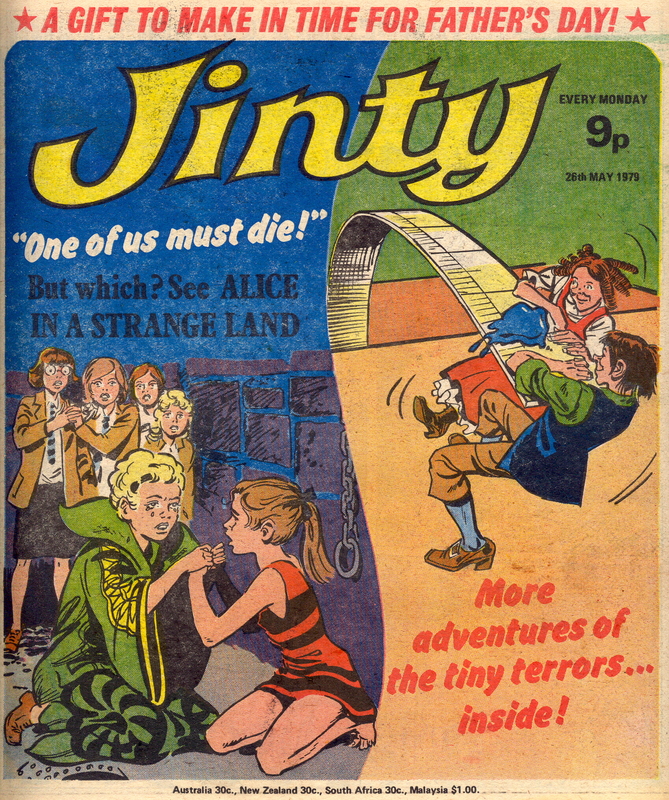 Most of the stories include Gypsy Rose as an active participant in the tale and helping to resolve the mystery; but later on a number of spooky stories from other titles had a panel of Gypsy Rose art pasted over the other storyteller so that it could be rebranded as a Jinty-style story. I have uploaded “The Ring of Death” into the Gypsy Rose summary post, so do head over to that to read it. You will notice some art that is repeated in subsequent Gypsy Rose stories, such as the image of her seated figure, displaying her patchwork skirt to best advantage. Malincha’s wicked uncle Telqotl is plotting ways to trap her and to steal the golden sceptre. The two girls manage to give him the slip at the museum but they are soon trapped in a department store and he has managed to put out all the lights by mystic means! Mandy Mason, the humble caretaker at an elegant beauty salon, ends up going to a posh safari park by accident and has a chance to turn herself into Raquel, the fearless white huntress. But at the end of this episode she is trapped in a cage with two adult lions running towards her as she holds a cub in her arms! Audrey Fawley draws lovely human figures but sadly the lions just look like round bouncy creatures who aren’t very convincing to my eyes. It is also the first episode of “Freda, False Friend”. Freda’s father is a police officer; he seems to have suddenly got a promotion as the family move to a posh big house and start driving in a swanky new car. It all turns out to be a ruse though – he wants her to make friends with Gail, the girl next door, because the police have suspicions about Gail’s father. Very unpleasantly for Freda, she is being made into a spy against her will! In “The Big Cat” Ruth saves a stag from being hunted by the local staghounds, but for her pains she is driven off from the village that she has been working in. It was a very unfriendly village, with people who hated to see strangers come along, but still it was a depressing thing to have happen. Martine is claiming that the ballet school is her house, even though it was sold to Miss Bond some time previously. The worry of what is happening to her sister causes Tessa’s ballet dancing to suffer, and her relationships with her classmates are also suffering. But the most dangerous thing is the chance it gives her jealous rival, to score over her! Emma Fielding is torn between believing in Alice’s attempts to be friends, and her father’s bitter denouncing of those attempts as just charity. The spiteful local girls look like they want to make it all go wrong for Emma, too. On the cover we see Betty, the sports mistress from the future serial “Life’s a Ball for Nadine”, supervising the high jump. Oh, just kidding! But the sports mistress does bear a striking resemblance to Betty. In the letter column there is a letter from one reader saying she cuts out the “Winning Ways” and gives them to her P.E. teacher, who pins them on the gymnasium wall. Benita Brown must have been so chuffed. Both “Blind Faith” and “Minnow” finish this issue. Clare has to forfeit her win because she entered under false pretences, but she has made her point about Cromwell being able to jump despite his blindness, so he’s safe now. Minna has to do a life-or-death swim to shore to get away from her kidnappers, which is a real test for a girl who’s only recently learned to swim. Her escape can be viewed on the Peter Wilkes page in the panel gallery. Their replacements next week are “Girl the World Forgot” and a new Phil Townsend sports story, “Child of the Rain”, which, come to think of it, was Jinty’s one and only tennis story. “Girl the World Forgot” is a castaway story, something that Jinty has not used since her earliest days with “Desert Island Daisy“, but it clearly takes the theme seriously, while Daisy used it for laughs. Spiteful Sandra is at her worst this week to make sure Kathy stays “the clown”, and it makes this episode a really cruel one. Under cover of pretend kindness, she tricks Kathy into eating too much food to stop her demonstrating her running talent at the sports centre. And just look at the monstrous amounts of food she’s coercing poor Kathy to eat. Talk about gavage! Pam guesses who has taken her witch ball and resorts to some sneakiness to get it back – while tricking the thief into making a fool of herself and cheer up her depressed gran into the bargain. Sir Roger thinks modern people don’t know how to make others suffer through torture these days. But after a trip to the funfair and trying out its rides, he changes his mind. This week’s Gypsy Rose story is another recycled Strange Story, which originally appeared in June. It treats Jinty readers to some John Armstrong artwork. The old maxim “you can’t take it with you” is put to the test with Black Rory, a robber baron who was so greedy that not even death would make him part with his ill-gotten loot; he had himself buried in full armour in a stone room with all his riches. It looks like being beyond the grave is not stopping his greed either, because his spirit is taking possession of generous Carly and making her insatiably greedy. And then he disappears from the stone room altogether…to spread even more greed…? Angela’s off to a boarding school, and Carrie goes along to ensure her bungling cousin stays there. But it all backfires in the end and they’re still stuck with Angela. ‘Start collecting our super colour 3 part game’, the cover announces. I remember thinking that the game (which involves moving between various eras such as Ancient Egypt and a time of dinosaurs) looked quite fun, but I would never have pulled the centre pages out to put a game together! I am not totally sure if the cover is done by the same artist who created the interior pages with the game – which look to me to have been done by Ken Houghton. Everyone is teasing Pam about her friendship with Goofy Boyle, making like they are boyfriend and girlfriend. Pam denies everything but of course that is also quite hurtful to Goofy, especially when Pam intervenes to save him from being beaten up by bullies. Tearaway Trisha has Trisha and Fran reconciling their misunderstandings – Trisha goes up onto the hospital roof to talk Fran down from the edge, but in the end Fran is the one who rescues Trisha when she wobbles and nearly falls off the side. All seems like it is going well for Trisha at the end of the episode, but she is too ready to be tempted by her old, rambunctious friends. Lucy Craven is under the spell of the Venetian Looking Glass: it has similarities to “Slave of the Mirror”, not least because they both include mirrors in the story title, but the fact that Lucy is enslaved by a set of shoes that her evil ancestor forces her to wear is a little spookier in some ways. Cousin Rosalind is in hospital because she fell from her horse, but that only happened because Lucy spooked her horse. She vows never to hurt her cousin again but the ghost of her evil ancestor has other plans. It’s the start of “Blind Faith”: one of the least plausible stories in girls comics, as it features a blind showjumping horse who is coached into winning events by his dedicated owner. In this first episode Cromwell is taken over the water jump by Clare, the daughter of his owner: she wants to prove she can help the horse overcome his nerves. Sadly there is an accident and Cromwell hits his head – which turns him blind. “You little fool!” says the unsympathetic father. “A few minutes ago we had a horse with a slight problem. Now we don’t have a horse” – as he leads Cromwell off to the knackers. Canoeing story “White Water” comes to an end in this issue – Bridie Mason and her frenemy Jocelyn get themselves into trouble because of a challenge they talked themselves into. They are in serious danger in the water and only great paddling gets them back to safety. The experience leads to them making things up with each other and coming to terms with their own foolish actions. This issue’s cover portrays two water scenes, but they are a complete contrast. In “The Forbidden Garden” it’s a life-or-death situation where Laika and Kara nearly drown in floodwaters, while in “Bizzie Bet and the Easies” it’s fun-and-sun by the sea. And for once Bet scores a final laugh over the Easies. In “A Girl Called Gulliver” there’s water trouble too, as our last Lilliputians set themselves sailing down the river in an old tea kettle – only to find they forgot to check it was seaworthy first, and it isn’t! It’s the last episode of “Casey, Come Back!”, one of the three-part stories that appeared in Jinty in 1979 but give the impression they could have done with more prolonged treatment. Next we see the start of the Jinty classic, “Almost Human”, and “Mike and Terry”, Jinty’s response to popular demand for a detective story. Pandora’s difficulty with maths has forced her hand to use the witchcraft box. But she finds she won’t get her box to work unless she gets herself a familiar, which means swallowing her dislike of cats. So meet Scruffy, the cross-eyed cat who doesn’t like Pandora any more than she likes him. “The Disappearing Dolphin” leads the scuba divers to exciting archaeological finds. But Mrs Ormerod-Keynes, who is trying to stop the expedition, is not impressed. Now why could that be? Alley Cat artist Rob Lee breaks the fourth wall and presents Alley Cat with some tasty treats to cheer him up in the last panel after Alley Cat gets a bit of a disappointment with this week’s episode. Linette’s actions to shut her father’s music out of her life is really hurting her schoolmates, who are still fans of it. This week she has to change schools as well, but her attitude is making the transition even more difficult. The cover on this week and the following week’s comics are drawn by the unknown artist who gave us “Concrete Surfer” – lovely fun summer scenes! Edited Feb 2018 to add – this artist is now identified as Christine Ellingham. Alice is rescued from being sacrificed – partly because she is smart enough to take off the Sun Goddess mask and show the priestesses that she is not really the goddess they thought she was. That wouldn’t save her from the High Priestess herself, but Sir Edward turns up in the nick of time and tells her that it’s all over – the fountain of youth has been blocked by the earthquakes and their eternal life will soon come to an end. A split in the ground carries away the mad priestess and Alice is safe – if she can just get back to where the other girls are so they can all get away together! Laika is stuck in the Industrial Zone where she can’t look after her plants in her Forbidden Garden – the only hope that is keeping her ill sister alive is the promise to have a flower of her very own. Suddenly everything changes: Laika is dragged off by the Child Protection Force, who say that she has been deemed highly intelligent and must be taken away from her parents so that she can be brought up as befits her intelligence. What next? It is the last episode of “I’ll Make Up For Mary“. Poor sad Ann thinks there is no way out other than the very final way of going back to where Mary was drowned! Luckily the friends she has made even during her struggles, and her parents who have never stopped loving her, rescue her. 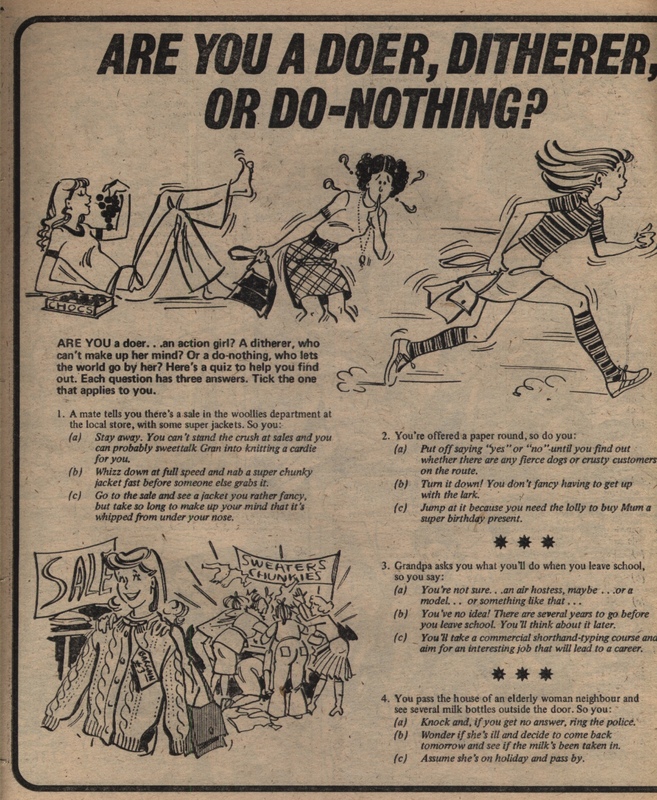 Quizzes were a very normal feature of girls comics and magazines: here is an example. I love this artist, who featured in lots of items like this – features, quizzes, and articles published in summer specials and annuals. I wonder what his or her name was? “Daughter of Dreams” is not one of Jinty’s best or most memorable stories. Sally Carter is shy: she has invented an imaginary friend who is outgoing and slightly obstreperous. She has such a strong imagination that her friend ends up coming to life – and even being able to do things like rescue the bully who has fallen into the canal water! Sally is too scared to do it herself, but finds that she is being fêted as the heroine of the hour – which is perhaps even harder for her to deal with. Laura’s mum is really angry with her husband, who has borrowed scruffy mongrel Riley to help protect the house after a burglar broke in. Riley and Winston are very glad just to be able to hang out together! And there’s more – the father is actively working to support the local council estate, by building a supermarket nearby, which will help to bring much-needed amenities to the area. In the dramatic last episode of “Children of Edenford”, Patti is taken down to the Temple of Purity – yes, the headmistress has got a temple of fire, named after herself! – to be sacrified on the altar of Miss Goodfellow’s ambitions. Unlike other sacrificial lambs, Patti is no pushover and she fights back – and the fight sees Miss Goodfellow tipped down into the firey pit of her own making! All is over, and the world is saved from the threat of being turned monstrously, unwillingly perfect. “Alice In a Strange Land” is coming to a distinct climax – it starts off with Alice and her schoolgirl party in a dungeon, coming up with a plan to save their skins from the high priestess, who is planning to sacrifice Karen to the Sun God! Alice swaps places with Karen and waits heroically during the long ceremony, hoping frantically that the girls will be able to get away and find Sir Edward in time to stop the priestess. But the last panel has got the knife being raised over Alice’s chest, ready to be plunged down! Will it all work out in time? Gwenny Gulliver has to handle the annoying four tiny Lilliputians who claim that as the last descendant of Lemuel Gulliver she needs to protect them. She needs protecting from them, as the two kids of the family start flinging ink pellets and all sorts while at school! Mary has finally cracked – she flies into a rage at school, and runs off after flinging the school dance club records at all and sundry. When she gets home she overhears her parents say they need to move north to start again – ‘We must think of Ann… Ann’s all we’ve got left now.’ Ann, despairing, thinks there is only one way out – ‘I’m the one who must go… There’s only one thing left to do!’ The last episode is next week, and all will be resolved. “The Four Footed Friends” has a surprise for Laura – it’s her dad, returned from his work abroad! He has a very different take on things from Laura’s mum, including borrowing Riley to come and help guard the house from burglars (because their house has just been burgled). Miss Goodfellow has caught Patti good and proper – red-handed smashing the bottles of the mystery drug that turns people perfect! The headmistress’s plan is to drug Patti into submission. Friend Jilly is nearly caught too: she escapes the school but when she flags down a police car to get away, even the local cops are in Miss Goodfellow’s thrall! Patti cannot be zombified, because of the extra-bad hay fever causing her eyes to stream and weep, so the headmistress swears to – burn out her imperfections instead! The final episode is promised for next week – so it will be a very exciting week for readers.